As I mentioned during the most recent episode of The Nichiest Podcast Ever, I've been giving serious consideration to selling my good ol' Xbox 360 as of late. So, with the 3DS quickly gaining a foothold in my brain, the PS3 still occupying my dreams and the soon-to-be-released Wii U doing its best to nudge its way into my life too, I've been wondering for a while now why I don't sell my Xbox 360 to someone who would give it the attention it deserves. The problem is, of course, that selling it likely wouldn't provide me with much of a windfall. Also, all of the money I spent on XBLA and XBLIG games basically would flow down the drain, as I wouldn't be able to include those titles in the sale of my system. Also, there are a number of both digital and retail games that I'd still like to pick up--games such as Bayonetta, Blue Dragon, Catherine, Otomedius Excellent (maaaayyybe), Space Channel 5: Part 2 HD and Terraria. What do all of you think? Do you think I'm making the right decision or am I making a horrible mistake? Bayonetta's pretty good, but I should've never bought Terraria. Way too hard, frustrating and un-fun. I guess I'm just not wired for the Minecraft-type games the kids are into these days. Personally I've never sold a system, but I'm kind of a pack rat too, so maybe you shouldn't listen to me. I love the look of Terraria and I've heard such glowing things about it that I have to try it. Not sure playing it with a controller is the way to go though. Guess I'll find out soon enough! Although I used to sell some of my systems, warp, I made the decision a few years ago to never do so again -- as I inevitably find myself wanting the sold systems again. That said, I think I could make an exception to that rule with the 360 -- if I actually wanted to sell it. Unlike pretty much every system I've ever owned, I don't feel any real sort of attachment to the 360. I would miss Pac-Man Championship and a few other games, though, so at least there's that. You aren't missing much not playing Castle Crashers. Always thought it was a poor mans Konami beat'em up. I much preferred the 360 to the PS3 but these days I much prefer the PS3. It just has much better exclusives such as Valkyria Chronicles etc. I also like free online gaming since the only thing I use it for is Dark Souls and paying for my games in real money. There's still some good exclusives on 360 especially on XBLA. Treasures output has been great and it's fantastic to finally own a legit version of Radiant Silvergun and Guardian Heroes. I like what I've played of it, Retr0gamer, but I do have to admit it's really not my kind of game. Of course, I play most games solo, and beat 'em ups really are more fun if others are sitting next to you, joining in. I'll definitely agree with you that the PS3 has the better exclusives at this point. Actually, I think the PS3 always had the better exclusives in my mind. I only went with a 360 when I did because: 1) it was cheaper, and 2) I thought I'd have bought a PS3 as well by now. You're also right, though, that the 360 has a number of great exclusives via XBLA, and they're certainly nothing to sneeze at -- at least in my opinion. I would NEVER sell my baby! 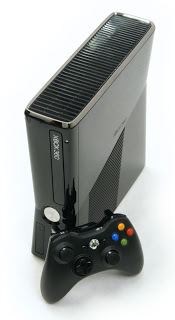 It was the first new-gen-console I bought (fine... this is the 3rd Xbox360 in my life. First two were taken down by the Red Ring of Death). I'm not a download-game-person because I like to hold in my hands what I spend money on (and I love manuals with good designs). I agree with you that there are no soooo many good only-on-xbox-games as on other consoles and if a title were released for both, PS3 and X360 it probably looks better on the PS3 but there are some games I would never ever play on an other console than the 360. And there are many more on my to-buy-list. I bought Catherine Stray Sheep Edition on PS3. Sorry I just had to tell you what games I like. I've long been curious about both Lost Odyssey and The Last Remnant, by the way. Enchanted Arms, too. Not sure I'll ever pick any of them up, but you never know! Although I prefer my PS3 as a media machine, the 360 is my preferred gaming system. One thing that most people don't think of when comparing the two is the hard drives. Granted, both systems now have pretty expansive ones, but it used to be a big problem. For me, my 80GB(!) PS3 quickly ran out of space from mandatory (retail) game installs. Because of that I really prefer 360 because you just have to stick in a disc and play, not wait forever for downloads/installs, or lose too much space. I wouldn't suggest Otomedius though because it just didn't jive with me (even though the cover was garish and incredible). It seems your list and Melody's list overlap a bit. That's certainly a good sign! Your point about Otomedius is well taken, BTW. Also, I've heard similarly wary comments from others in the past -- hence the "maaaaayyyybe" side note that was attached to the game in this post. Yeah, that's likely my problem with the system, Adam -- especially when it comes to retail games. I'm just not a fan of either fighters or shooters :| Oh, well, I knew that when I bought the system, so I can't really complain! I think you're right, Marcus! Also, don't worry too much about me picking up Oneechanbara -- it really doesn't look like my kind of game. Actually, I'm not sure Assassin's Creed is either. Maybe I'll check it out at some point, though. What do you like about that series, BTW? Warp, I'm curious if you got Terraria for XBox of PC? I bought the PC version (before it was cool, ha!) and I love it! But I can't imagine it being fun on a console...soo hard to control with a controller! Justin, I actually bought the PC version on Steam as well, because it was on sale for like $2.50 or something. I've tried it with and without a controller, and I just end up dying within a few minutes either way. Actually, Justin, I don't think the Xbox version is out yet. I think it comes out next year? Anyway, I'm definitely planning on trying the demo before buying! Assassin's Creed II is fun in a very simple sort of way. Like, you just get the freedom to traverse the world you're plopped down in and that's really engaging when paired with missions that aren't all the same exact thing. I liked being able to run around on roof tops and be really cool while progressing in the game. Story isn't quite so enthralling, but the experience is nice. I really enjoyed it and blasted through it in a weekend. Unfortunately, none of other AC games made me feel that way, but I'm hoping 3 + Liberation will. As for full releases the 360 probably has the least impressive catalogue of exclusive games. Yes, I think you're right, Trxd. And, really, I haven't been at all disappointed by/with the XBLA and XBLIG games I've purchased thus far, so there's really no reason to give it up, is there? Ah, I love your taste in games, Jess! I love a good RPG now and then (or more often! ), too :) Sadly, I've yet to play any of the ones you mentioned here--although I do have Blue Dragon and Lost Odyssey on my wish list. Anyway, glad to hear you and your son are enjoying the 360 and the Kinect! I started my gaming career as an RPG junkie so they will always have a special place in my heart. Is there a way to get notifications of replies to posts? Just curious. Oh, that's great to hear, Jess -- that you're an RPG fan, I mean. So am I! Always have been, always will be, I think. As for notifications of replies: How are you posting comments at the moment? Are you doing so by logging in through Discus (discus.com)? If not, you may want to sign up w/ Discus and post comments that way, as I'm pretty sure doing so will send such notifications to you through e-mail -- or at least that's how it works for me! When I first posted here it asked me to sign up with that but then asked if I wanted to use Facebook or Twitter. I used Facebook as a sign in...? I've gotten no notifications since posting on here. Yeah same here, I stopped getting notifications since I started using Facebook. Seems like a bug. So, Steve, you used to get notifications when you signed in using Discus, but now you don't get that when you sign in through Facebook? Hmmm, interesting. It may be a bug, but it also could just be that you have to sign in using your Discus log-in info to get notifications.